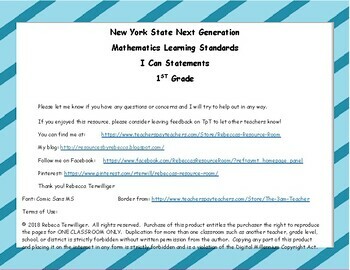 These “I Can Statements” come from the revised New York State Learning Standards, now called The Next Generation Learning Standards. While many of the standards are the same as before, the language has been changed to make the standard less vague. 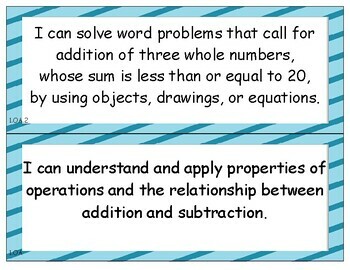 56 - Math I Can Statements. Each framework section was broken down into manageable goals and written in student-friendly I Can statements. 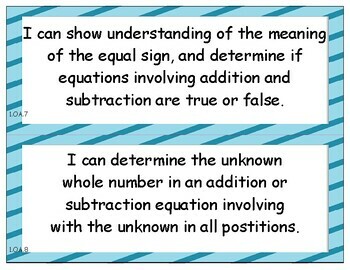 (Each I Can Statement is displayed on a colorful mini-poster (2 mini-posters per page). 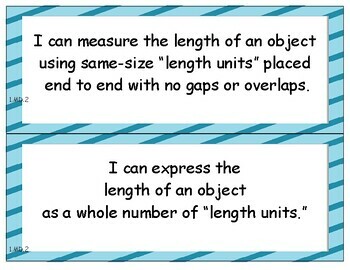 Display the mini-posters in your classroom to help students clearly understand the standards they are expected to master. Please let me know if you have any questions or concerns and I will try to help out in any way. If you enjoyed this resource, please consider leaving feedback on TpT to let other teachers know! school, or district is strictly forbidden without written permission from the author. Copying any part of this product and placing it on the internet in any form is strictly forbidden and is a violation of the Digital Millennium Copyright Act (DMCA).